The term “Green Smoothie” can apply to a wide range of beverages but a genuinely healthy and nutritious green smoothie must contain considerable amount of fresh leafy greens such as spinach, kale, lettuce, Bok Choy, etc. along with a mixture of fruits, seeds and other ingredients. When preparing a smoothie, green leafy vegetables should form the base of the beverage because these low-calorie and high-fiber foods help in sustainable weight loss. The dietary fibers present in leafy greens reduces the percentage of body fat and body weight. One of the most important points to keep in mind while preparing a smoothie is to use a blender for blending the vegetables and fruits into a smooth and chunk-free smoothie. While a normal electric mixer-grinder can be used to prepare a green smoothie, but the heat generated by the grinder affects the flavor and nutrient profile of the vegetables and fruits. On the other hand, blending your fruits and vegetables in a blender does not generate heat, and, therefore, majority of nutrients present in the smoothie stays intact for a longer period of time. 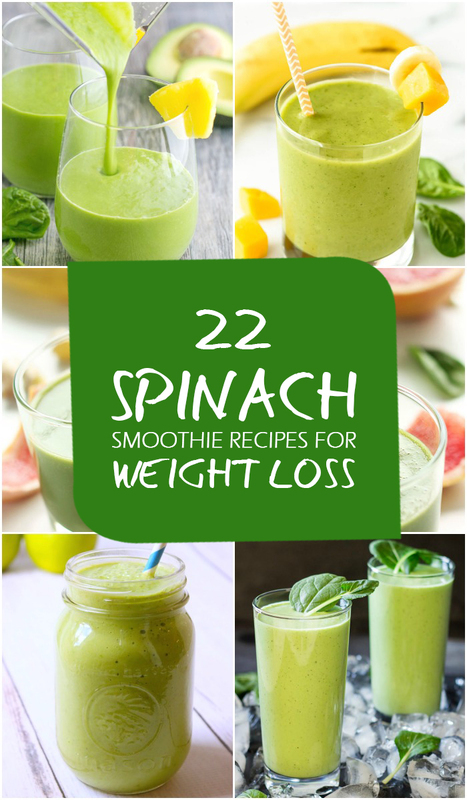 So, let us check out some delicious and nutrient-packed green spinach smoothie recipes for weight loss. Those of you who are into healthy eating and smoothies must be familiar with the name Kimberley Snyder. She is a nutritionist for the mind body and soul and the best-selling author of “The Beauty Detox Solution”, “The Beauty Detox Foods” and “The Beauty Detox Powder”. She is the creator of the world famous Glowing Green Smoothie that has taken Hollywood by storm. The Glowing green smoothie not only helps to give you clear and healthy skin, but also helps in weight loss and weight maintenance, improves digestion and increases energy levels. The glowing green smoothie is one of the easiest ways to get more fruits and vegetables into your daily diet. Leafy greens such as spinach and lettuce are extremely beneficial for weight loss. They are packed with high-quality; easily-assimilated amino acids that help to support muscle mass and burn fat. Dr.Oz’s morning green smoothie is the perfect way to start your day. This healthy, gluten-free and 100% vegan smoothie is packed with fiber, vitamins and minerals and it works as a filling breakfast and snack. You can add a frozen ripe banana if you think that all the greens are too bitter for your taste buds. The potent detoxifying properties of cucumber, celery and parsley work together to drive out accumulated toxins and waste material from the blood and gut which helps to kick start the metabolism of the body that promotes weight loss. The thermogenic effect of ginger also helps to activate metabolism, making it a powerful fat burner. 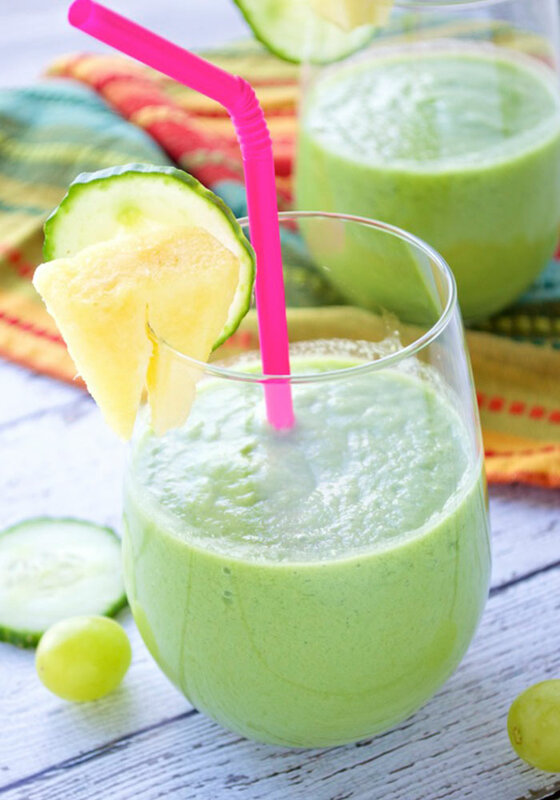 This refreshing green smoothie is great to taste and the spicy kick of ginger makes it all the more delicious. It is packed with the goodness of nutritious greens that supplies all the essential vitamins and minerals to your body. 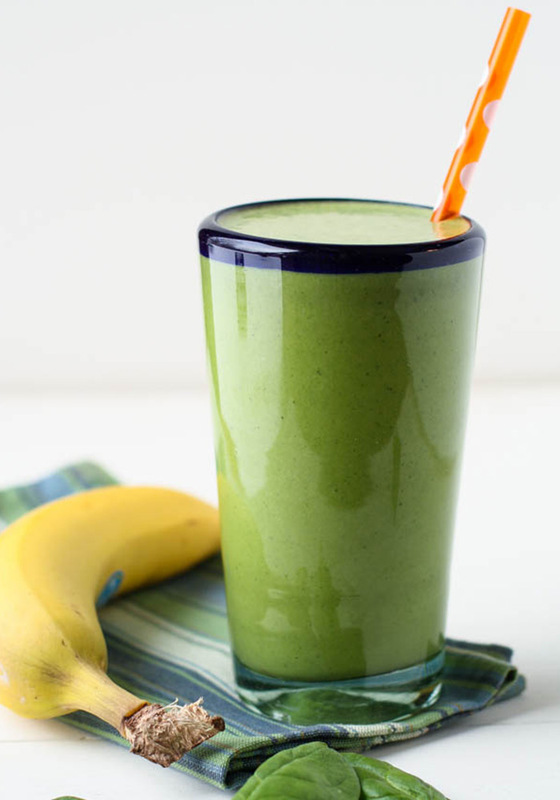 The banana and orange renders a mellow sweetness to the smoothie and balances the bitterness of the spinach. The cucumber and romaine lettuce adds much needed hydration. The fiber and nutrients present in spinach makes it a filling food that aids weight loss without adding many calories. The fiber and cellulose in lettuce improve digestion which is essential for long term weight loss. Oranges are low in calories and the fiber found in oranges help regulate blood sugar levels and controls hunger and cravings. The fibers present in bananas are resistant starch which also supports weight loss. 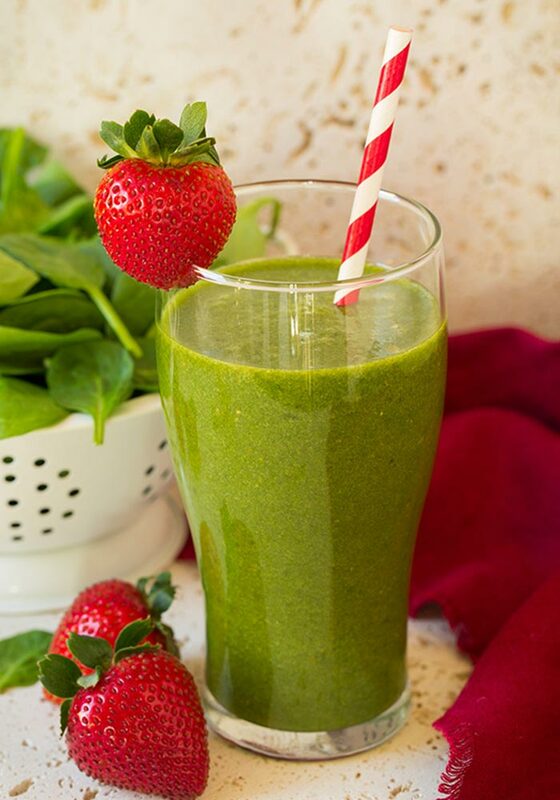 This mouth-watering spinach and strawberry smoothie is the perfect way to pack in some fruits and vegetables in your daily diet and detox your body after loading up on empty calories during the holidays. The best thing is this recipe requires only a few ingredients but the end product is mind-blowing. Baby spinach offers twice as much fiber compared to other greens. Thylakoids in spinach decrease cravings for sugary foods and increases satiety. Strawberries help promote weight loss by increasing the body’s production of a hormone that stimulates metabolism. This wholesome and filling spinach banana smoothie is a great breakfast that keeps you full until lunch. The delicious almond butter, Greek yogurt and banana beautifully cover the bitter taste of the spinach and add a rich creamy texture to it. The resistant starches in banana slow down the digestion process and this help to feed the healthy gut bacteria which in turn suppress appetite and promote weight loss. Bananas also prevent bloating and flatulence. Both almond butter and Greek yogurt act is rich sources of protein that supports lean muscle mass and helps to burn calories. This tangy and sweet smoothie is packed with antioxidants and refreshing flavors of pineapples and green apples. 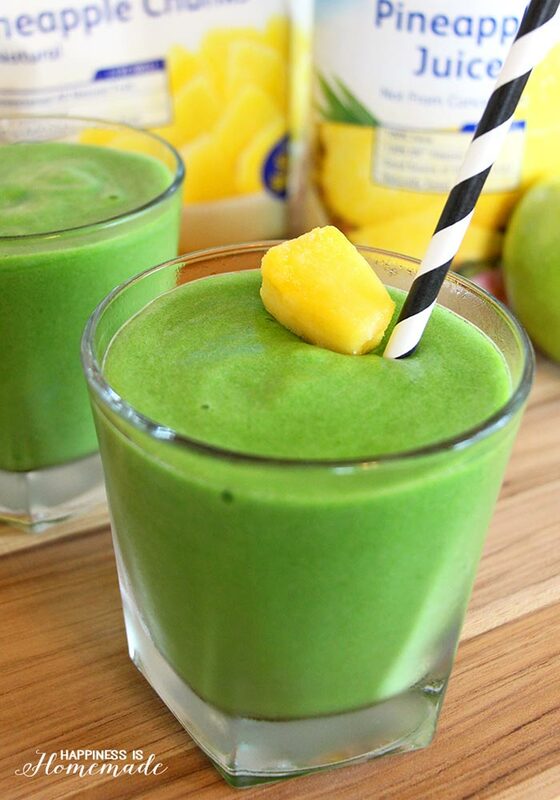 The sour and sweet taste of the pineapple and apple perfectly hides the pungent taste of spinach and adds some thickness to the smoothie. The powerful soluble fiber pectin found in apples delay stomach emptying so that you feel full much longer. Pineapple is a low-calorie and fiber-rich fruit that has fat burning properties. Bromelain, an enzyme found in pineapple helps in digestion of protein. 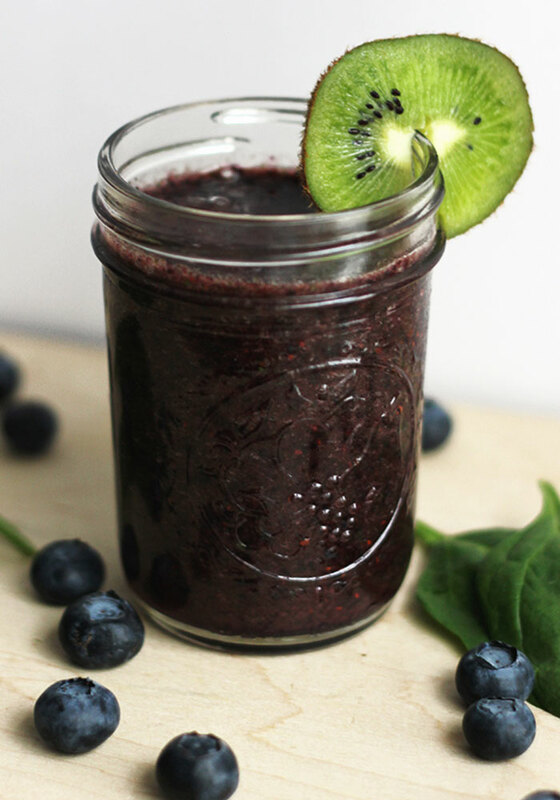 Indulge in the sweet and tart taste of this delicious blueberry mint smoothie and bask in the nourishing goodness of spinach, kiwi and berries. The mint leaves add a hint of refreshing flavor to the smoothie while the tartness of the fruits balances the pungent taste of spinach. Antioxidant catechins found in blueberries activate the fat-burning genes in the abdominal fat cells that help in weight loss. It is especially useful for removing deep seated belly fat. Kiwi works as a slimming food because of the presence of soluble and insoluble fibers that helps to cleanse the digestive system. 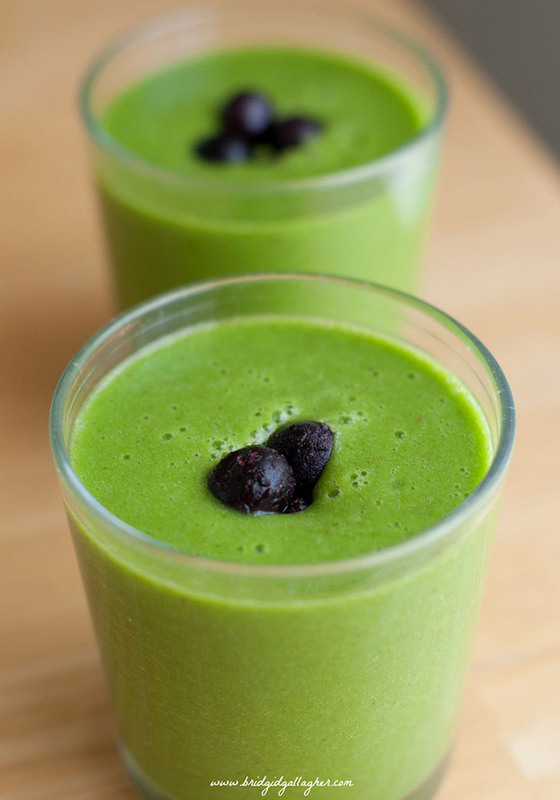 This vibrant and creamy green smoothie is a one-stop solution for all your nutritional Needs. It is nutritious, energy boosting, wholesome, filling and delicious. What more can you ask for in a smoothie? 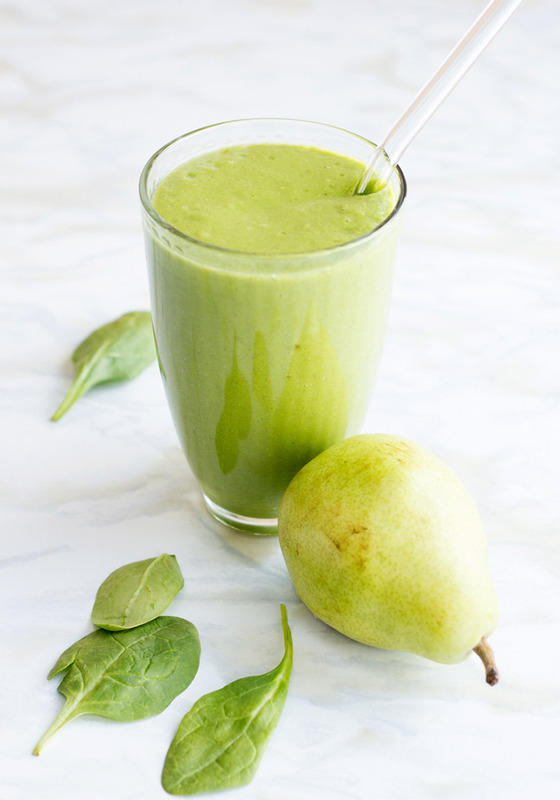 The avocado and pineapple renders a smooth creamy texture to the smoothie while the sweetness of the honey balances the mellow bitter taste of the spinach. The monounsaturated and oleic fatty acids in avocado target stubborn abdominal fat and reduces the risk of metabolic syndrome. Avocados also provide high level of satiety and prevents craving for junk food. High water and fiber content in pineapple help in curbing appetite. This healthy and wholesome breakfast smoothie is the best way to get back to healthy eating after a weekend of treats. The bananas and apples provide a perfectly balanced sweet and tart taste and masks the bitterness of the spinach. The Greek yogurt packs a protein punch and adds a nice creamy texture to the smoothie. Green apples are naturally low in calories which make it ideal for your weight loss efforts. 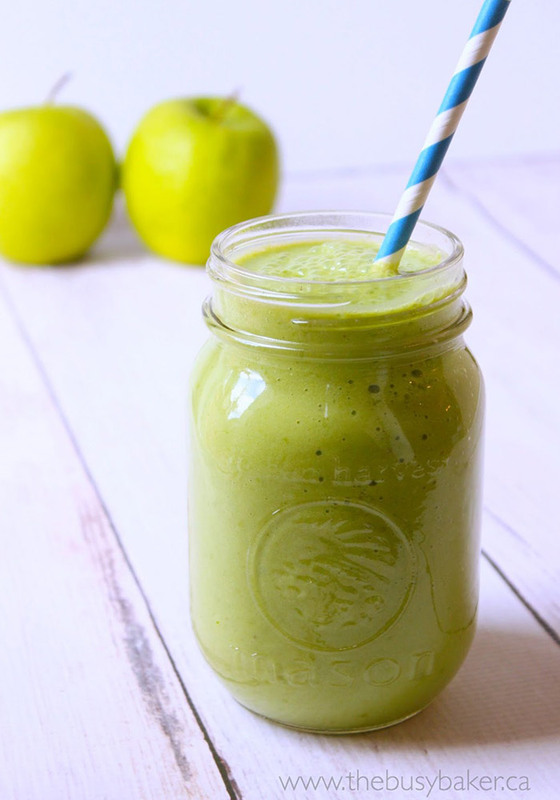 The soluble fibers in green apple attract water and form a gel-like substance in the intestine that slows down digestion so that you may feel full for a prolonged period. High levels of calcium in Greek yogurt directly influence weight loss efforts. Calcium in Greek yogurt increases the breakdown of fat in the body and preserves metabolism. Sweetening your green smoothie with soaked dates is a great idea. It helps to cover up the bitter taste of the spinach without loading up on sugar and empty calories. The pear and banana packed some nutrient and protein punch into the smoothie while the unsweetened milk adds some thickness to it. The high fiber content of pears helps the body feel full longer and reduces the likeliness of snacking. It also helps in maintaining regularity of the digestive system which is also essential for weight loss. Fructose and glucose present in this fruit provide natural energy boost and the low GL index of this fruit results in slower carbohydrate absorption that stabilizes blood sugar and controls cravings for food. Savor the wonderful tropical taste of this sweet and creamy mango green smoothie and make the most out of its amazing health benefits. This smoothie calls for 4 basic ingredients but the final result is mind-blowing. The sweet and tangy taste of the mango perfectly blends with the pungent taste of the spinach and gives a perfect balance to the smoothie. The almond milk and banana renders a rich creamy texture to it. The phytochemicals found in mangoes act as natural fat busters and inhibit the development of human fat cells. Mangoes have a high concentration of beta-carotene and other nutrients in concentrated form that reduces the consumption of calories. What better way to kick-start your day than with a glass of rich and creamy peach green smoothie loaded with health-benefitting nutrients? It supplies energy to the body to keep it charged throughout the day and it takes only a few minutes to prepare. The peach and lemon juice adds a perfect balance of sweetness and tanginess to the smoothie while the chia seeds add a protein-punch to it. Peaches help to ward off metabolic syndrome. Belly fat is a predominant determinant of metabolic syndrome that increases the risk of obesity-related diseases. Chia is a source of high-quality protein and fiber that aids weight loss by reducing appetite and cravings. 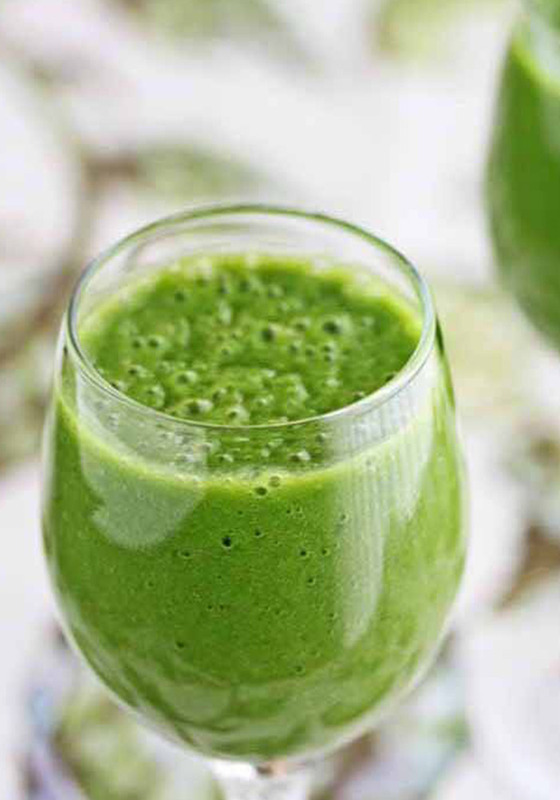 This power-packed green smoothie contains some effective green ingredients such as spinach, Bok Choy and kale but trust me it does not taste like grass. Greek yogurt, honey and pear add a mellow sweetness to the smoothie and removes the bitterness of the greens while the cucumber and kiwi add the much needed hydration to it. Leafy greens can help you to get full without adding much calories or fat. Spinach, kale, bok choy and other greens work as an aid to weight loss. The presence of fiber gears up the digestive system and regularizes bowel movement which is extremely important for weight loss. Enjoy the delicious and refreshing taste of this perfect pick me up smoothie and back in its numerous health benefits. This green smoothie boasts of the perfect balance of healthy veggies and sweet fruits along with a hint of coconut water that adds a tropical taste to it. You can have it for breakfast or lunch and notch up your store of lasting energy. Both cucumber and grapes are loaded with fiber and water and extremely low in calories which helps to increase satiety and reduce hunger pangs for a long time. Mint helps to prevent bloating by relaxing the stomach muscles and increases bile flow which improves the digestion of fats. This super-delicious layered smoothie may look high-end, but it’s extremely easy and simple to make and it is packed with the goodness of spinach, banana, pomegranate and strawberries. The tangy-sweet pomegranate and strawberries perfectly hide the taste of spinach and the banana renders a smooth and thick texture to it. The strawberries and pomegranates supply a truck-load of antioxidants to the smoothie that reduces the risk of cancer. Pomegranate juice attacks stubborn belly fat. It blocks triglycerides, the unhealthy fats found in the blood and removes them even before they can be stored in the body. This rich and creamy green smoothie is packed with immunity-boosting vitamin C that helps to fight off cold and flu while cutting out those extra pounds. The sweet and tart taste of the carrots, strawberries and blueberries balance the pungent taste of the spinach and the orange juice adds a refreshing touch to it. Both carrots and berries are considered super-foods for weight loss. Carrots are packed with vitamin A. Our body converts vitamin a into retinoids and chemicals that interact with the fat cells and prevent the growth of new fat cells and also influences fat storage and obesity. Vitamin A in carrots is especially effective in reducing abdominal fat. Give a healthy and fresh start to your day with this refreshing and re-hydrating detox smoothie. It is so delicious and filling that you can enjoy it any part of the day. The tangy and tart taste of the berries blends well with the slight bitter taste of the spinach. The flaxseed add a much-needed protein and fiber punch to the smoothie. Cucumbers have high water content and very few calories which help to fill you up without adding calories, which is in fact a great way to lose weight. The diuretic property of cucumber reduces water retention and increases fluid intake. Omega-3 fatty acids in flaxseed help to boost metabolism which helps in rapid calorie burning. This is a rich and creamy breakfast smoothie loaded with the inviting flavors of cinnamon, cardamom and nutmeg. 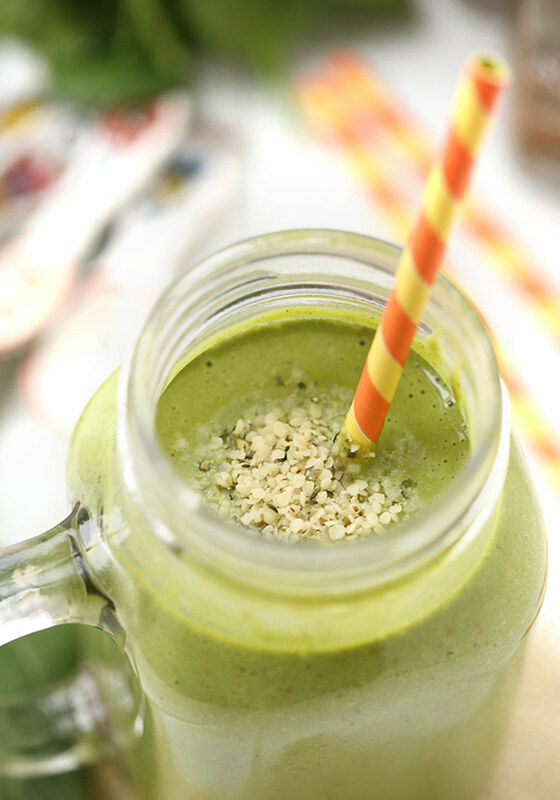 The almond butter, almond milk and banana provide the perfect consistency to the smoothie and its mellow sweetness beautifully balances the bitter taste of the greens. Both almond milk and almond butter contains good fats – omega-3, omega-6 and omega-9 fatty acids that prevents build up of bad cholesterol and stabilizes blood sugar. Vitamin E and magnesium present in almond milk and butter prevents sudden rise or dips in blood sugar levels which in turn reduces food cravings. The blackberry banana smoothie is the ideal green smoothie for picky eaters who don’t like the taste of greens in their smoothie. The tangy and tart blackberries cover up the taste and color of the greens and the banana adds a hint of sweetness and nice creamy texture to it. Blackberries are low in calories and rich in fiber that helps to promote bowel movement and aids detoxification. It helps to eliminate toxins and undigested waste matter from the body which is essential for weight loss. Blackberries also aid in removing bad cholesterol from the body. The high fiber and protein content in chia seeds help in weight loss by reducing appetite and promoting the growth of lean muscle mass. This light and super-refreshing smoothie works as an amazing snack as well as a filling breakfast. The tart and bitter taste of the grapefruit is perfectly balanced by the sweetness of the apple and banana. Ginger adds a refreshing touch to the smoothie while the frozen banana gives it the perfect texture – somewhere between a juice and a traditional thick smoothie. Grapefruit is loaded with fiber that helps to keep you full for longer period of time and reduces the chances of mindless snacking. Certain compounds in grapefruit stabilize blood sugar levels and reduce insulin levels which help the body to use food for energy in a more efficient manner rather than storing it in the form of fat. Starting your day with a grapefruit smoothie promotes the liver enzymes to work efficiently and helps to curb cravings. This is a healthy and nutritious green smoothie that can be prepared ahead and stored in the freezer so that you can have a ready-made refreshing smoothie first thing in the morning. Blueberries and raspberries make a delicious flavor combo and add a nice sweet-tart taste to the smoothie along with a boost of antioxidants. Banana adds a mellow sweetness to the smoothie and the oats packs in some volume to keep you full till lunch. Both raspberries and blueberries work wonders for weight loss. Raspberry Ketone is a fruit enzyme that breaks down fat cells that accumulate in the body. Berries are packed with fiber and manganese. While fiber slows son the digestive process and helps you to stay fuller for longer the manganese increases body metabolism and help burn body fat. 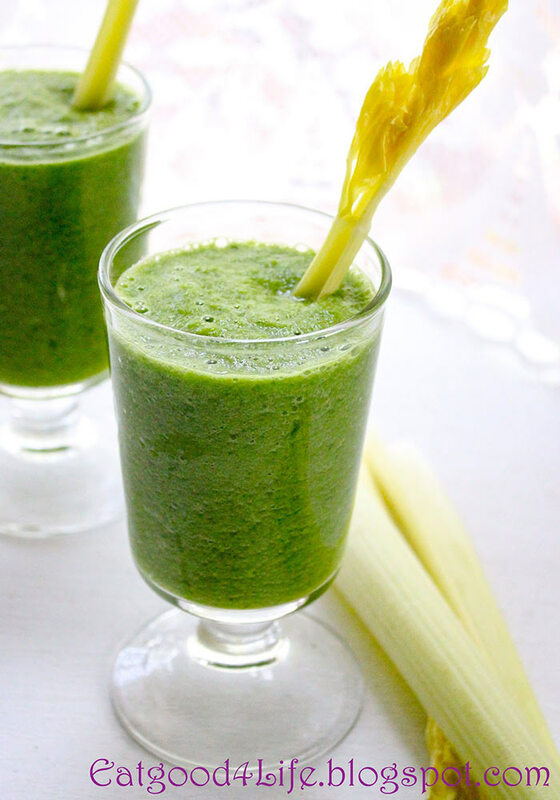 The tangy and mellow green tea green smoothie is perfect for beginner smoothie drinkers. This green smoothie packs in at least 3 servings of fruits and vegetables and it can be served for breakfast or enjoyed as a snack. The Grapes and banana makes it more fruits than vegetal and completely masks the taste of the spinach. Ellagic acid found in grapes increase fat burning process of the body, especially in the liver. It promotes healthy functioning of the liver which helps in losing weight. The bioactive substances in green tea have powerful effects on metabolism. These substances promote the fat cells to break down fat and release it into the blood stream so that it can be utilized as energy. So, what are you waiting for? 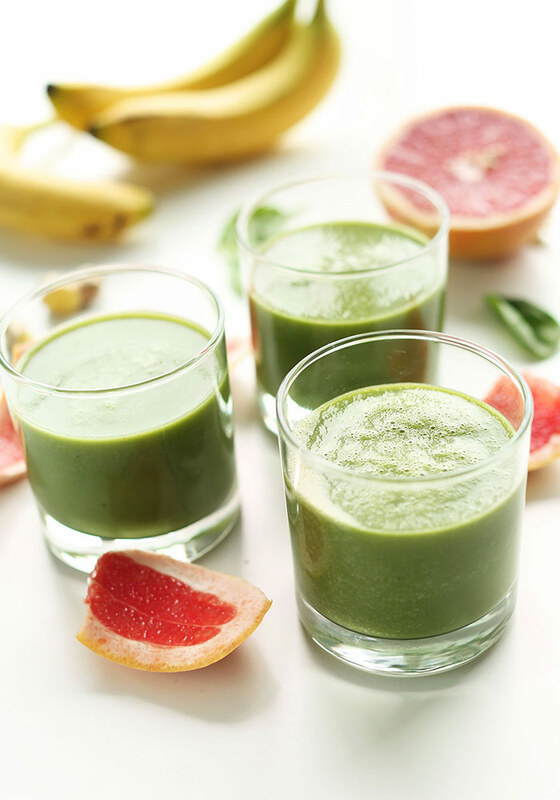 Get your blender ready and start preparing and enjoying these nutrient-dense spinach smoothies in order to lose weight and transform your body from the inside out.